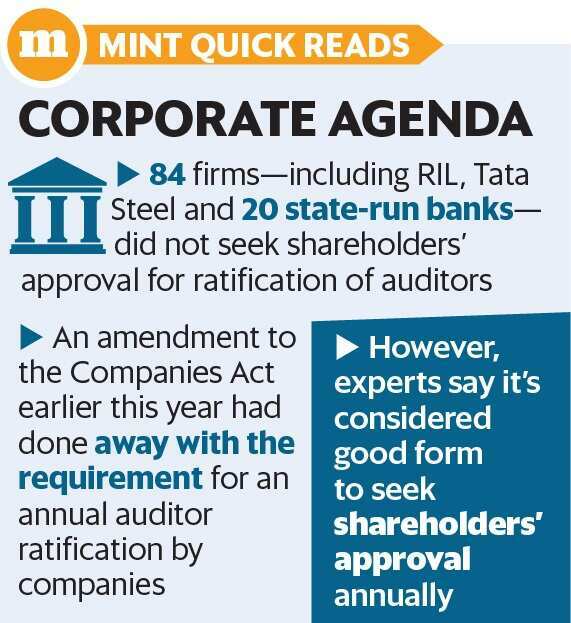 Bengaluru: More than half of the 161 companies that have held their annual meetings this year, including Reliance Industries Ltd (RIL) and Tata Steel Ltd, did not seek shareholders’ approval for ratification of auditors. Eighty-four of the 161 companies that held their annual general meetings (AGMs) between 1 May and 15 July did not seek auditor ratification, according to data compiled by Glass Lewis & Co. Llc, a US-based proxy advisory firm. This includes 20 state-run banks. An amendment to the Companies Act earlier this year dispensed with the requirement for an annual auditor ratification by companies, although it’s considered good form to seek shareholders’ approval annually by corporate governance experts. Removing the mandatory annual ratification rule has limited the accountability of auditors to shareholders and has curtailed their say on audit issues amid rising cases of accounting frauds, according to proxy advisory firms. As many as 32 auditors resigned in the first five months of 2018 without providing a definite explanation as to why they have quit, according to data compiled by Prime Database, a primary market tracker. “Removing the requirement for annual auditor ratification is a curious move given the overall climate. Auditor oversight has become a significant issue in India, particularly after the ban issued against PwC (Indian affiliate of PwC) by the Securities and Exchange Board of India," Jeff Jackson, manager, Asia Research, Glass Lewis, wrote in a note, titled Auditor Ratification in India: Are Shareholders Missing Out? earlier this month. In January this year, Sebi barred Price Waterhouse from issuing audit certificates to any listed company in India for two years over its role in the Satyam scam. Under the Companies (Amendment) Act, 2017, effective May 2018, the annual auditor ratification was removed, unless a company appoints a new auditor or is re-appointing an existing one. “As it stands, accountability to investors has been significantly reduced at companies which have moved away from annual auditor ratification. With no opportunity to vote against the auditor themselves, it will be interesting to see whether concerned shareholders instead direct their opposition towards the members of the board, and particularly of the audit committee, who took ratification out of their hands," according to Jackson. Significantly, 20 state-run banks did not seek shareholder approval for ratification of auditors even as their private counterparts such as HDFC Bank Ltd, Axis Bank Ltd and Yes Bank Ltd put the proposal before shareholders to vote. An email seeking comment sent to some of these companies, including RIL and Tata Steel, went unanswered. 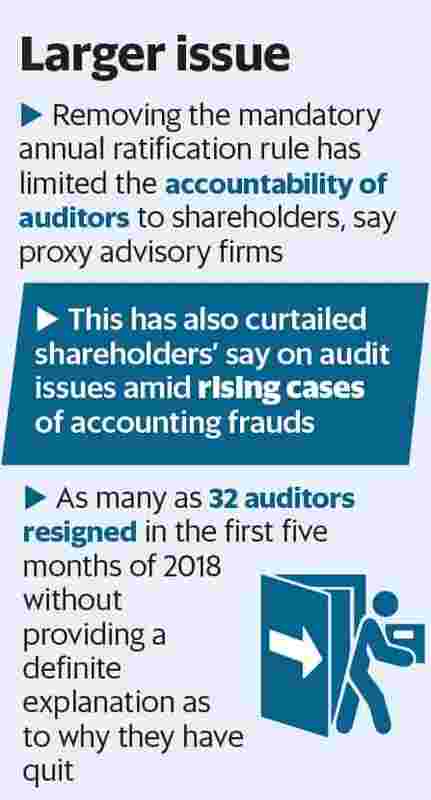 “It’s a valid question if it’s okay to not give shareholders the right to check on the auditors, every year, especially when so many auditors have resigned this year," said a partner at a Bengaluru-based audit firm on the condition of anonymity. “MCA (ministry of corporate affairs) should address this," the person added. Still, some experts say that the move to do away with the annual ratification has some merit. “I do not believe that it is a regressive step," said Jagdish Sheth, who teaches at Emory University in the US. “There is always the risk of some activist shareholder creating trouble for a company’s management and board. And one of the easiest routes is to ask for a change of auditor. For this reason, some of the minority shareholders may just dissent or vote against auditor ratification. Then again, how many minority investors even know about the auditor of a firm is a moot question to ask," said Sheth, who in the past has been an independent director at a few companies including Wipro Ltd.
Jackson of Glass Lewis disagrees. “There isn’t compelling evidence that minority investors have been appropriating the vote on auditor ratification for activist purposes. Furthermore, if taken to its logical conclusion, this line of argument would lead to all minority shareholder rights being curtailed because of the ‘risk’ of activist shareholder ‘creating trouble’, however remote," he told Mint.